I still love the first one the best, with the beautiful lighting through the fall trees. 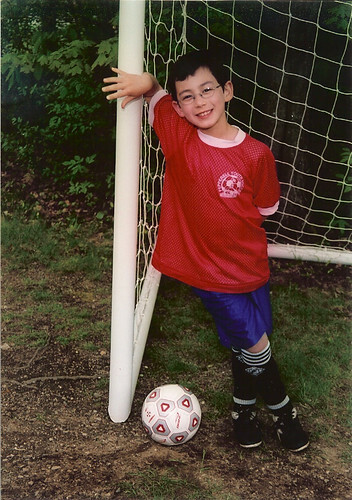 For last year's spring soccer season, Adam at age 6, was supposed to be in the U6 (under age 6) division, because he missed the cut-off for U8 by three months. I appealed to the soccer board to allow him play in U8 because he clearly had the skills for it. It was an arduous process, getting recommendations, writing letters to the board and waiting to see if there were any spots available, etc. In the previous fall season, he was running circles around the other players, scoring six to eight goals per game. It wasn't fair to the other players who were just learning, or to him because he wasn't being challenged. And thankfully, he thrived under his U8 coach. He clearly started to learn more about the game, passing and strategy. At the end of the season, all his teammates were abuzz about try-outs for the U10 travel team. Of course, when the coach asked me about it, I had to tell him that he was only 6, so it was out of the question. And since it was such a pain to appeal, I vowed not to push for the U10 travel team before he was eligible. Besides, I want to delay having to drive him to all parts of the state at all hours of the day for as long as possible. Fast forward to this past spring season. Now he was officially in U8 and the buzz about the travel team try-outs came again. I simply let the try-out date pass by knowing that his time would come next year. But afterwards, his new coach came up to us and said that he really felt Adam should be on the travel team and he was going to appeal for us. Really, has he become that much of a star? I actually missed most of this year's soccer season since I took him to the the early morning hockey games on the same day (he will never complain about doing too many sports). There were soccer games where he didn't score goals this season, especially against really good players, although he still averaged about three goals per game. But apparently he is getting known in our little soccer community. I still have mixed feelings about the travel team, but at least this time I don't have to do the work for the appeal (haven't heard anything yet thankfully). At his last game of the season, I watched as he made this awesome pass from half field - he kicked the ball way over all the opponent's heads and it landed right next to his teammate in front of the goal who kicked it in. Just like the professionals. Afterwards, he kept saying, Mom, did you see that pass? Did you see that awesome pass? That's my boy. July 22, 2008 - Edited to add: We just heard that Adam is officially on the U10 travel team. Woo hoo! And so it begins.